When violence breaks out, it is our own heart that is ripped by the blade. South Africans, some children, are killed; diplomatic and economic relations are damaged; the economy suffers; attitudes harden; views are polarised; police grow more heavy-handed; and, in the end, living conditions don’t improve. And yet, the anger and violence continues to be misdirected. By ALEX ELISEEV. Much of this weekend was consumed by an ethics storm that blew across South Africa following the publishing of James Oatway’s photographs of Emmanuel Sithole’s murder. Speaking on radio on Monday morning, the respected photographer calmly recalled the circumstances leading up to the stabbing and the moments of chaos that ensued immediately after, including how he and his colleagues rushed the wounded man to a local clinic and then to hospital. Whatever emotions were swirling inside Oatway, lay hidden. His to bear. He did say the entire episode felt surreal, like he had watched it on television. While others will move on with their lives, he will wrestle with these memories for the rest of his. Not that he needed to, but Oatway defended the publishing of the photographs, saying that people “need[ed] to know”, that they needed to see the “brutality and vulgarity” that haunts the streets of places like Alexandra. In other words, brave people like Oatway go into extremely dangerous situations and bring the horrors out so that those who vote or those who lead cannot dare say they didn’t know. Oatway says he has no regrets and did exactly what he was supposed to. He acted as a photojournalist and as a human being. His voice changed slightly when he spoke about Sithole’s dying moments, when those helping him had no idea how serious – or indeed mortal – his wound was. Sithole seemed full of energy (more likely adrenalin being replaced by shock) and was speaking to those trying to save him. He had walked away from the attack before collapsing on the pavement. Oatway’s only regret is that the clinic that they rushed the Mozambican man to was unable to help him, and so the most precious time was lost. Of course nobody could have known this. Sithole was then driven to a hospital, where he died. His answer had a narrow focus: this particular attack, this particular story. But at the same time, it reverberates into a much bigger understanding of where South Africa is as a country at the moment: a nation where far too often anger is misdirected. 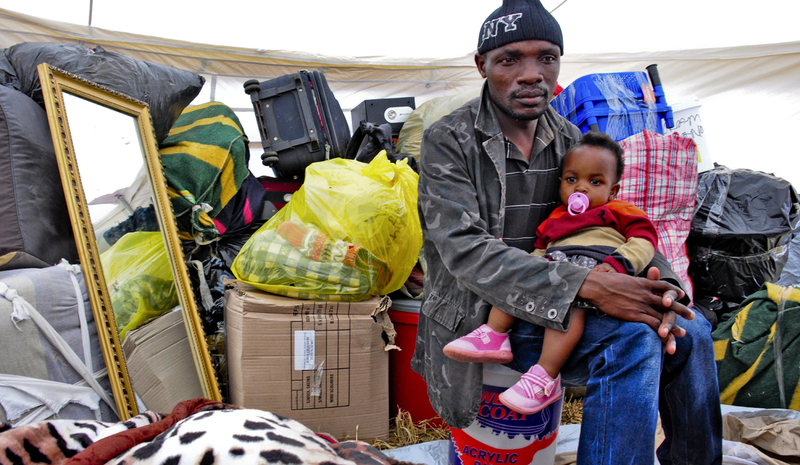 In the latest spate of xenophobic violence, and in those that came before it, the fury is aimed at foreigners instead of those responsible for the hopeless conditions in which millions of people continue to live. There are no easy answers, of course. The history is painful and remains with us; change is slow and difficult, the problems deep and stubborn. That’s why fury morphs into blood-lust. A blind slash of a knife at a fellow human being. But it is our own heart that is ripped by the blade. South Africans – some as young as 14 – are killed; diplomatic and economic relations are damaged; the economy suffers (and with it job creation); attitudes harden; views are polarised; police grow more heavy-handed; and, in the end, living conditions don’t improve. And yet, the anger and violence continues to be misdirected. When communities take to the streets to demand better services, clinics and libraries are torched. Buses and trains are destroyed. Police stations are overrun. Children are blocked from attending the schools. Out on the roads, in traffic, personal turmoil and frustrations boil over into deadly road-rage clashes. Behind closed doors, women and children fall victim to forces that have nothing to do with them. Around dinner tables or braais, racists generalise wildly in all directions. Around gold or platinum mines, rival unions hack each other to death. Illegal miners go to war deep underground, hauling out dead bodies. Taxi drivers rage over routes, with many people dying in the fight. In politics, feeble attempts are made to deflect anger associated with national scandals to an architect or some low-level army officials. Political attack dogs charge and bite crucial institutions or those who lead them. Instead of a more open society, journalists are accused of threatening national security in a bid to ram through the so-called Secrecy Bill. NGOs become enemies of the state, outspoken opposition leaders “spies” and the blame continues to be heaped on everyone and everything except those in power. In Parliament, MPs hurl insults at each other or are ejected by the police officers, while inside the police service and other law enforcement agencies, factions plot each other’s downfall. On the same morning that Oatway spoke, President Jacob Zuma continued to question the publication of the photographs (Were they good for the country? Were they patriotic?) and had yet another go at journalists. This despite the fact that had the photographs not emerged, Sithole’s murder would probably never have been solved. It’s unlikely there would have been swift arrests and justice for his family. At his “imbizo”, Zulu King Goodwill Zwelithini was doing much the same, saying that the media should be investigated by the Human Rights Commission (which is investigating him for claims that his comments about foreigners sparked the latest xenophobic violence). Zwelithini used the occasion not only to condemn the “vile” attacks (which he clearly had to do) but to continue defending himself and to peddle conspiracies about dark forces. Other speakers came up with creative new ways to explain his earlier comments, slapping one explanation on top of another, hoping that soon nobody would be able to tell the difference or remember the initial remarks. The crowd was restless, defiant, singing songs about foreigners going home.